Location: Newtownstewart, County Tyrone, Northern Ireland. Notes: Stewart Castle (also known as Newtownstewart Castle) is situated in Newtownstewart, County Tyrone, Northern Ireland. It was built in 1619 by Sir Robert Newcomen in an English manor house style. 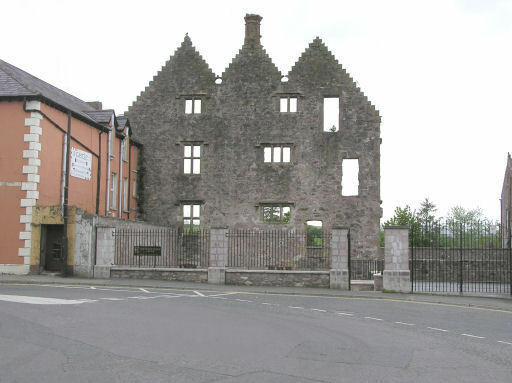 It suffered extensive damage during the Irish Rebellion of 1641 and its subsequent capture by Sir Phelim O' Neill, and in 1689 on King James' return from the Siege of Derry. King James ordered the Stewart Castle, and the town, to be burnt down. In the main street a piece of the castle wall still stands. Newtownstewart Plantation castle is a State Care Historic Monument in the townland of Newtownstewart, in Strabane District Council area, at grid ref: H4020 8583. An intact Bronze Age cist grave was found within castle site. It was excavated in 1999.